some investors want full auto-pilot on their investments during retirement. many investors will have cognitive impairment sometime during retirement. many investors will develop outright dementia sometime during retirement. all investors planning to leave assets for the benefit of others will die. portfolio construction for these conditions differs from pre-retirement years. It is widely acknowledged that longevity risk (risk of outliving your investments) in retirement must be addressed in portfolio construction. Probabilistic projections such as Monte Carlo simulations are an important part of that process; as well as designing so that withdrawals can be taken from somewhat stable value assets during equity bear markets, to reduce the risk of ruin associated with selling assets into a decline. In contrast, is not widely acknowledged that cognitive risk with aging in retirement should also be addressed. 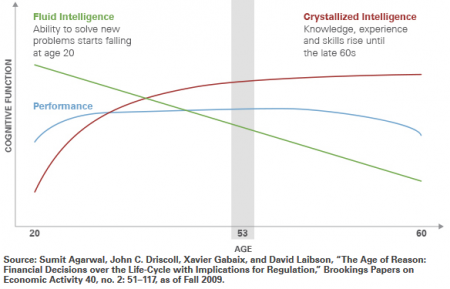 There are numerous dimensions to dealing with cognitive risk, ranging from how assets are titled and held, lines of succession of decision-making if the investor no longer has the capacity to manage assets, and how to structure the portfolio (and the advisor relationship) so that as cognitive decline slowly creeps up from minimal to meaningful, investments are not endangered by lack of attention, poor decisions or conflicts of interest. For some investors, particularly during or preparing for near-term retirement, target date funds from a major institution may be a suitable choice for part of the cognitive risk mitigation element of retirement. They may not be a suitable choice for everybody, but clearly are for some. Let’s look a little bit at cognitive decline and then a deep dive into what is actually inside target date funds. This is not an argument against using an advisor. I am one myself, but not everybody wants to, has affordable access to, or should use an advisor. Similarly (and this can be an argument for either an advisor or a target date fund), not everybody can, wants to or should manage their own money. There is a lot of study and discussion of behavioral finance, with an emphasis on the problem with doing the wrong thing with investments due to emotions overriding logic, and filtering information for confirmation of biases. That is all well and good to understand, but less well discussed are the behavioral issues of reduced cognitive capacity and less effective problem solving related to aging. That is a real issue to think about before retirement, and to put the proper vehicles, instructions, trustees and portfolio together at least by the time of retirement, if not before. Remember, you could have an event at any age that reduces your cognitive capacity (such as a traumatic brain injury from an automobile accident). “As we gain experience, we become better investors. But our ability to solve novel problems [is] peaking around 50–55, and then we’re gently declining thereafter. The decline tends to become steeper as we age, and by the time we’re in our 80s, for many of us, the ability to make good decisions is significantly compromised, particularly decisions that involve complicated new problems. …. The likelihood of dementia .. doubles every five years … starting out as tiny levels in the early 60’s .. by the time we get to our 80’s, the likelihood of having dementia is about 20%. … and about 30% of the population in their 80’s has cognitive impairment but not dementia … in total, half the population in the 80’s is not in a position to make important financial decisions. 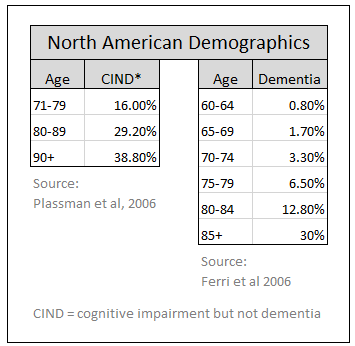 He provided this data on the prevalence of cognitive impairment and dementia in North America. State Street Global Investors published a paper in 2016 titled “The Impact of Aging on Financial Decisions”. They also talk about the difficulties advisors have raising and exploring the investment implications of aging; and the reluctance and fear clients have discussing the topic or planning for what needs to be done. They discussed many aspects of aging and investments, including a mini-max graph of increasing wisdom and understanding with experience versus declining problem solving ability, with the suggestion that people are generally at peak decision-making capacity in their mid-50;s (as shown in the image below). I am sure than many of you have witnessed the cognitive decline problem in real life with your parents or other people in your family or among friends, as I have as well. You may also have observed or been involved in modifying the investments and investment management control of portfolios for parents no longer able to monitor and control the situation, as I have as well. It is good to do all you can to minimize those problems ahead of time. Heredity is luck of the draw, but there is some hope to pushing that cross-over point farther into the future. It is about brain exercise in youth and throughout life. Just as your body is a use it or lose it proposition; so to is your brain, and its capacity to make decisions and solve problems. What are some of the arguments supporting target date funds? (2) In retirement, for many (and you could be one), there will come a time when cognitive skills will fade; at which point it may not be reasonable to manage one’s own money. At that time use of an advisor may not be a good choice, because the investor would no longer have sufficient intellectual capacity to adequately monitor the activity of the advisor, and would not necessarily know when or if to make a change — and in a change may not have sufficient intellectual capacity to make a good substitution choice. (4) After death, presuming there are significant residual assets in a trust, or to be put into trust, for a surviving spouse or other family members; there is no opportunity for the deceased investor to assure that the money is being managed responsibly, cost effectively and prudently, if left to the judgement and decisions of trustees to manage it themselves; or to retain an advisor or broker or annuity agent to do the job, particularly non-professional trustees. (5) After death, if a professional trustee is used, that is another significant layer of expense, that portfolios can ill-afford, — as cost control is one of the keys to long-term total return. (6) Cognitive decline and death aside, target date funds for some may be a reasonable way to hold a core position (a boring, quiet bucket) in a portfolio at any age without the complexity of owning multiple broad core funds — using the other assets to tactically tilt overall exposures, or to pursue specific opportunities (an interesting, active bucket). For those and similar reasons, some people may be good candidates for a large or full allocation of their portfolio to a low-cost, index-based target date fund from a well established investment organization that is likely to be around longer than the investor is likely to be alive; or longer than the portfolio is expected to exist post-death. Even if target date funds are not the best investments, they are far from the worst. They are diversified, world asset, all season funds, suitable for a long-term horizon. Why emphasize large, well established organization? An advanced age investor who has cognitive impairment would not be in a position to make a change decision if the target date fund was liquidated or the investment organization changed so radically that the target date fund moved in a different direction, or the expenses ramped up. We think Vanguard is a particularly good choice. Their target date funds are massive, and invest in a collection of massive low-cost index funds, none of which is likely to be liquidated. They are a mutual company, which means they are not a takeover target as a stockholder owned assets manager may be. Because they use index funds, their target date funds are not subject to risk of a manager going “sour” or leaving and being replaced by someone of lesser talent. They have great depth of skills at index management. Remember, you might be holding the target date fund for a very long time. All that said, a well selected advisor, can do something a target date fund cannot do, and that a robo-advisor can’t do well — tailor a portfolio to the specific goals, preferences, risk limits, asset complexity, tax exposures and other circumstances of each unique individual investor (which can be complex with wealthier investors) — as well as to help keep the investor on an even emotional keel, to avoid emotional versus rational investment decisions during periods of excess risk enthusiasm or pessimism. Even if you don’t like the idea of target date funds, they are a large and growing part of the employee benefits landscape. They currently account for 12.5% of assets in employer defined contribution plans, such as 401-k and 403-b plans. They are projected to be 48% of plan assets by 2020, according to Kiplingers. It is a lot less stressful on employees to choose a retirement date than an asset allocation plan among plan choices. And, it is less stressful (and lower liability) for employers to offer target date funds along with the traditional menu of stock and bond funds. Target date funds are here to stay, so people should be aware of them. Investors can get fancy and complex in their portfolio construction, but in the end 3 primary asset categories have been shown to determine the vast bulk of portfolio returns (80% to 90% in some studies). That leaves only 10% to 20% of return coming from asset category subsets of the primary classes and from security selection. There are only 3 things you can do with investment money (outside of speculating with derivatives such as options and futures), and those are Owning something, Loaning money to others, and holding cash or equivalents in Reserve. Accordingly, we refer to those categories as OWN, LOAN and RESERVE. For the most part, OWN is stocks, but it also includes tangible assets such as real estate, physical commodities such as gold, and private equity funds and venture capital investments. For the most part, LOAN is bonds, but it also includes private debt funds, private individual mortgages and other non-traded debt. RESERVE includes sweep cash in brokerage accounts, demand accounts and ultra-short CDs at banks, fixed price money market funds, and variable price ultra-short bond funds, and cash under the mattress or buried in the back yard. 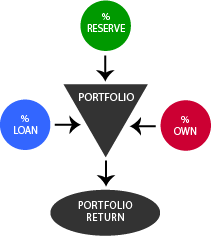 OWN, LOAN and RESERVE is a functional description of asset categories, instead of a mere label such as equities and bonds. We believe using functional terms helps investors better understand what is in their portfolios. We have examined target date funds timeline glide paths in terms of those functional categories. To keep it very simple, and because target date funds conceptually do not raise tactical reserves, we have combined LOAN and RESERVE in the glide path chart as simply LOAN. A key attribute of target date funds is the “glide path”. Each fund sponsor has a planned schedule of allocation change for each fund as the current date approaches the fund’s stated retirement target date. The glide paths of the leading fund sponsors differ, but they behave similarly, as shown in this glide path chart for 6 target date fund families that carry current Gold or Silver ratings by Morningstar for expected forward relative performance within their class. Those families are: Vanguard, Fidelity, T. Rowe Price, BlackRock, JP Morgan, and American Funds. All are no-load funds at the retail level, except American Funds, which are load funds. We specifically recommend against investing in any load fund. There are just too many good no-load funds to give up assets to a load fund. At the 401-k or 403-b level American Funds are not load funds. In this chart the black lines are for the Vanguard funds (solid line for OWN) and dashed line for (LOAN). 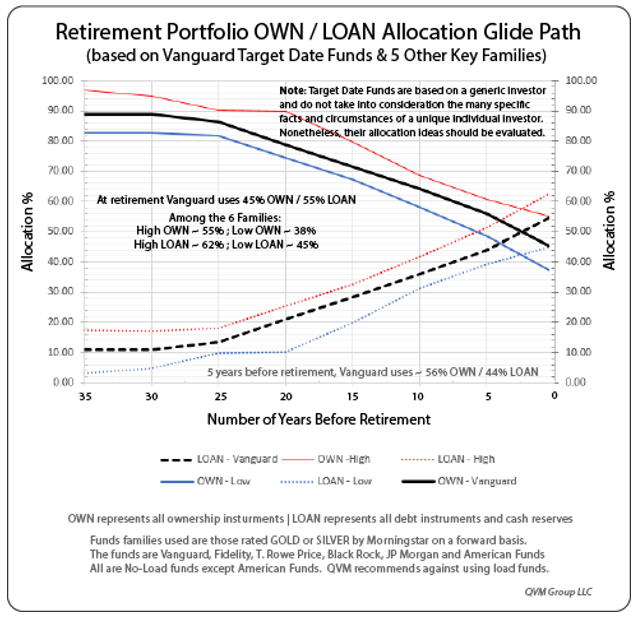 The red lines are for the highest allocation for OWN and LOAN by any of the six fund families along the path. The blue lines are for the lowest allocation for OWN or LOAN by any of the funds. It may not be unreasonable to “capitalize” highly secure pension income as if it were from bond holdings, and to use that capitalized value in measuring the OWN / LOAN allocation of your “portfolio”. For example, if an investor receives $30,000 from Social Security, at a 3% capitalization rate, that is the equivalent of having $1,000,000 in AAA bonds (at 4% capitalization rate the bond equivalent is more like $750,000). And since there is a COLA on Social Security, it’s better than a bond which has fixed interest payments. The same sort of capitalization could be done with a pension benefit from employment. You might want to put that capitalization into your asset allocation assessment, and potentially take on less actual LOAN assets and more OWN assets to achieve your overall intended risk level, in light of your secure Social Security and pension income. 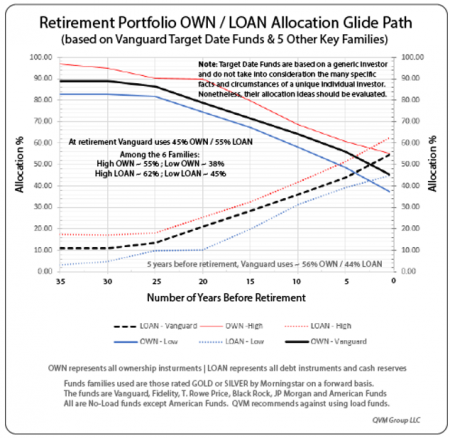 Vanguard ends up with a 45% OWN and 55% LOAN portfolio in retirement. Within the group of six families the highest OWN allocation in retirement is 55% and the lowest is 38%. The highest LOAN allocation is 62%, and the lowest is 45%. So for someone following the same general approach using multiple funds, those sponsors are suggesting for retirement somewhere generally in the 55% OWN/ 45% LOAN to the 40% OWN to 60% LOAN range. Vanguard in the middle area at 45% OWN/55% LOAN. Note that target date fund are basically funds-of-funds. They just hold them for the investor in the target date fund wrapper and do the rebalancing and allocation shifting automatically over time. When it comes to the allocation to sub-classes within OWN and LOAN, the funds separate more in how they structure the portfolios. In addition to the difference between active management and index funds within OWN and LOAN; the allocation to US and international assets differs; as does the allocation to large-cap and small-cap equities; as does the allocation to duration and credit quality among bonds. They also hold different levels of cash, perhaps more as a function of tactical decisions among those using active management instead of indexes within their funds. For those nearing retirement, a year 2020 target date fund may be of interest. Let’s look deeply at the six 2020 funds to see what is inside. The title in the charts should be sufficient to let you know what they are about. 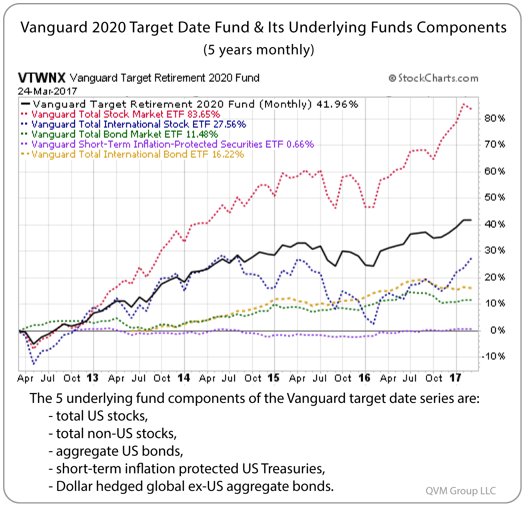 In each case, data for Vanguard’s 60/40 balanced fund (domestic only, using S&P 500 and US Aggregate bonds) fund is provided for comparison — that being a traditional all-in-one fund. 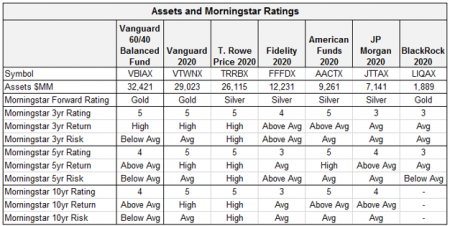 In terms of return and risk ratings by Morningstar, the Vanguard target date fund is superior. Keep in mind as you view the allocation between US and international assets, that this level of portfolio allocation is programmatic, even if the security selection is active in some of the funds. Notice the allocation between developed and emerging markets diverges significantly. The allocation between economically cyclical, defensive and in between (sensitive) stocks differs markedly. So too does the equity sector allocation vary significantly. The rolling returns and volatility are more similar than the detailed portfolio composition. That is because the primary OWN/LOAN ratios more similar than the detailed portfolio composition. This is anecdotal support to the research conclusions that asset allocation between OWN, LOAN and RESERVE (mostly stocks, bonds and cash) determines perhaps 80%-90% of portfolio returns. And, that only about 10% to 20%, or so, of returns come from more granular asset allocation and individual security selection. You can see that T.Rowe Price had the superior returns, but at the cost of the highest volatility. The next table will solidify the appearance on this table that Vanguard had the best balance between return and volatility. 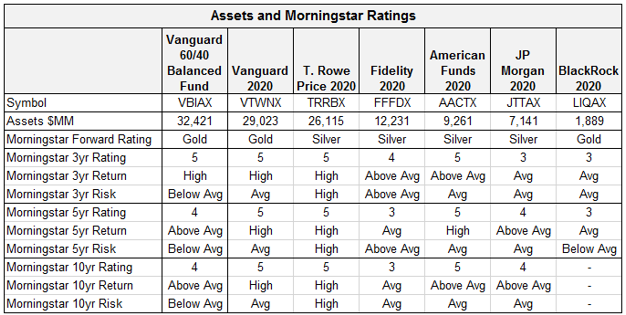 Vanguard and American Funds came out ahead in terms of risk/reward, both by Sharpe Ratio (which considers both up and down volatility), and the Sortino Ratio (which considers only downside volatility). On a calendar year basis, Vanguard had the lowest drawdown in the 2008 crash. For assets in tax deferred accounts everything comes out as ordinary income, but in regular taxable accounts, taxation of distributions and proceeds is really important. Taxation of proceeds depend on the investors holding time, but taxation of distributions is a function of what goes on inside the funds — long-term and short-term cap gains; qualified and non-qualified dividends; and interest earned — as reported on 1099’s to the IRS. Vanguard and T. Rowe Price look best in terms of after-tax distributions. These equity valuation data do not include earnings quality or earnings growth rates which would help interpret the valuations, but it looks like Vanguard has lower equity valuation multiples than the other funds — slightly more of a value proposition. Bond metrics are a little harder to compare visually, but here is a simple thing that may be grossly useful in comparing the overall valuation of the bond portfolios: multiply the yield by the duration and divide that by a numeric value of the credit quality (AAA = 1, AA =2, A = 3 …..). If you do that, Vanguard seems to give more yield for the combination of duration and credit quality than the other funds. Vanguard and BlackRock have only investment grade credit quality, while the other four families use some below investment grade credits. Fidelity and BlackRock are holding a lot more cash than the other funds. Target date funds may or may not be appropriate for you or someone in your family, but they should not be dismissed out of hand, as some have done. Target date funds might be used as a component of the broad-based core of an investment portfolio (the quiet, boring part); or for some people in retirement as the entirety of a portfolio. Please call — happy to discuss. This entry was posted on Saturday, March 25th, 2017 at 3:25 PM and is filed under Financial Advice, Investment Strategy, Retirement Investments. You can follow any responses to this entry through the RSS 2.0 feed. Both comments and pings are currently closed.